The right scratching post will solve one of the biggest challenges many people have with their healthy cats: destruction from sharp, healthy claws! And the destruction is usually on your favorite piece of furniture! Cats need to scratch and if you don't provide a place for them to do so, they'll pick their own place (and being creatures of exquisite taste, they often pick your favorite chair or sofa!). So for your cat's health, your furniture's protection, and your sanity, it's best to have something set up in your home for your feline friend before you even bring her home. She'll probably need a little guidance at first, but if you start her out right, there should be very few problems in the future. Declawing your cat is not a healthy alternative. Not only does this process take care of your cat's nails, but it also serves the important function of keeping the muscles in his legs, shoulders, and back toned. Your cat is not intending to be destructive or disobedient when she scratches your best furniture! You may notice your cat chewing his nails on his back paws. This is also normal and necessary for your cat. The back claws also need to have the outer sheath removed and since it's a little tricky for your cat to use the post to take care of this, she uses a more manual approach. Another thing your cat is doing when she claws on something is leaving her mark. The pads on your kitty's paws have scent glands that leave behind his or her personal signature. Humans can't smell this scent, but other felines can. And you don't need to worry that your cat may continue to scratch the furniture just to mark her possessions even if you already have something else for her to scratch. She can still leave her mark behind by rubbing the sides of her face (which also have scent glands) on the furniture. There's no reason why you can't train your cat to use a specific piece of cat furniture to meet all his nail grooming needs. Training him to use a post is both better for his physical health and for your furniture! Unfortunately, many people have the experience of buying a cat scratching post that their cat never touches. Many cheap (and sometimes expensive) posts have soft and dense carpeting covering them. Most cats don't like this softness and won't use furniture covered with it. Cats want something rough to dig their claws into. They need this roughness to remove the outer sheathes on their claws. If they don't get what they need from their post, they'll return to the firmer sofa or other rough furniture. The best posts are covered with a hemp product called "sisal." It looks like thick twine wrapped around the pole. Kitties love to dig their claws into this! Good cat furniture and posts must be sturdy and tall enough for your cat. If your cat is able to easily knock over the post with her body weight, then she won't use it. It should have a large, heavy base. Also, since the scratching action serves the dual purpose of toning your cat's muscles, it must be tall enough so that your kitty can fully stretch her body when she reaches up to scratch. Measure the cat scratching post to make sure it is taller than your cat's full-length stretch. Another thing to help ensure that your cat uses his scratching post is to make sure it's in a pleasant and easily accessible location. There's no point for your cat to go out of her way to find a scratching post when there's a perfectly fine sofa right there! 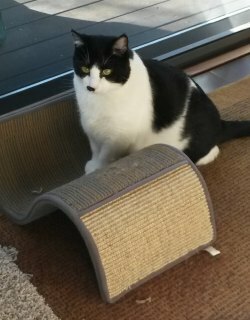 Placing the scratching post by your cat's favorite sleeping spot is a great idea. You've probably noticed how your cat stretches right after taking a nap. Many cats also love a good scratch after a nap. My older cat loves to sleep on her tall kitty condo, and after napping, she grabs a great scratch and stretch right there on the sisal-covered leg posts of her condo. Taller than your cat's full length. If you're bringing a new cat home, this is one piece of cat furniture that should be set up in your home before your new addition arrives. Some cats and kittens will need practically no training, but it's probably best to provide a little training to avoid confusion (and save your "people furniture!"). 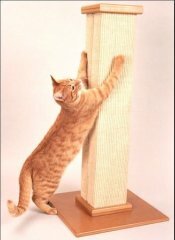 What's the best way for you to introduce your cat to her new cat scratching post? OK. Are you ready for this? The best way is for you to use it yourself. That's right, use it yourself. While your cat is watching you, run your fingernails down the post a few times. Some cats will imitate you and that will be all the training needed. If your cat doesn't get the idea, try holding a play string along the post in a playful manner. When your cat starts to play with the string, she'll discover that the post feels delightful to her nails, and she should pick up on the idea this way. Never force your cat's paws onto the scratching post. Although, you can take your cat gently over to the post if she starts to scratch on your furniture. If this happens, model the proper behavior by scratching on the post with your fingernails. During the training period and/or just to be sure your furniture is protected, you may want to consider using a product called Sticky Paws. These are transparent adhesive (on both sides) strips that you can apply directly to your furniture. Since they are transparent, they don't take away from the look of your furniture. (And they're approved by the ASPCA!) Your cat will hate the stickiness of the tape and will refrain from scratching there. You can put them on furniture, drapes, stereo speakers, and other places you want to protect. These adhesives are not recommended for leather furniture, wood finishes, painted surfaces, vinyl, or wallpaper. One inexpensive addition I've found that both my cat loves is a cardboard scratcher. It's essentially corrugated cardboard about two inches thick, and less than one foot by two feet wide (you can get a different sizes) inside of something that looks like a box top. It often comes with a small supply of catnip that you can sprinkle on the corrugated cardboard to tempt your cat (although, this doesn't work well with kittens). * Cat Furniture - What does your cat really need? * Cat Declawing Alternatives - Save your furniture and protect your cat. * Trimming Cat Claws - How to safely cut your cat's nails.